Young fishers were victorious at a charity fishing competition at Derbyshire’s Ladybower Reservoir, that raised more than £300 for Fishing for Schools. The event, on 22 September, was organised by the F4S Yorkshire and Peaks team and the money raised will go towards their courses with local schools. 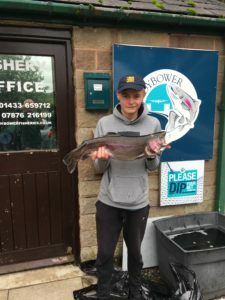 The winner of the top competition on the day – the best bag – was 15-year-old Luca Sutton from Clitheroe, whose catch for four fish topped the scales at 14lb 8oz. Luca also won the award for the largest fish at 6lb 4oz. Luca was fishing with his fellow England Youth Team member Isaac Slack (aged 14), who lives in Curbar. Between them they netted approaching 60 fish, meaning their boat had the greatest catch. In all 26 anglers took part in the match, catching 325 fish for an average of 12lb 8oz. The action on the water was followed by food and an auction in the nearby Ladybower Inn. Steve also asked for donations for Fishing for Schools on his birthday and personally added £80 to the pot from those. A very big thanks to Ladybower Fisheries and the Ladybower Inn for their support. Fishing for Schools is an initiative run by The Countryside Alliance Foundation (TCAF), the charitable arm of the Countryside Alliance. It provides free, short angling courses for schools across the country, to aid the education of 10 to 16-year-olds who may not respond to traditional classroom-based learning but flourish when you get them outside onto the water. It celebrated its tenth anniversary in 2017. Due to phenomenal interest in our courses, Fishing for Schools (F4S) is now operating an application process where schools use an online form to apply for our free sessions annually. We welcome applications both from new schools and those that have previously participated in F4S. All schools and educational establishments are welcome to apply. Our courses are suitable for children aged 10-16 years of all educational abilities.